When it comes to new bands, few can claim to have a more exciting line-up than Axewound, a band featuring members of Bullet For My Valentine, Cancer Bats, Pitchshifter and Rise to Remain. TNS sits down with drummer Jason Bowld to discuss all things Vultures. As the band boasts such an impressive line-up from both sides of the Atlantic, the question of how they came together immediately arises. Bowld reveals that the formation of Axewound was somewhat of a simple affair: "Me and Matt Tuck (Bullet For My Valentine) shared a common interest in metal, and decided to put a really heavy side project together, with Liam (Cancer Bats), Joe and Mikey joining once we decided to put an album together and it was a match made in heaven." And so Axewound were born, a group of people Bowld describes as "Nice and easy to work with, bringing an extra bit of chemistry into an already exciting band." Having members from already well-known bands can be exciting for fans, but it certainly brings a level of expectation to their music. But Bowld believes it hasn’t really affected the bands approach to the album, stating: "I think the expectation can hinder you if you let it, but we've kept our focus on the music." Elaborating, he says: "When we got together we didn’t try and make something out of our reach, we did what came naturally. Matt and I got together and said “right lets just write brutal stuff, keep it changing and not get comfortable." Consequently, the bands debut Vultures was written in 21 days, keeping overthinking to a minimum and leaving little time for tinkering. The end product is an album that that Bowld is proud of. However it would appear fan expectation has played on his mind since: "In some ways our old bands have made things harder because people might expect more. But for us we’re content doing what we like and writing something fun." And the result is Vultures, an album Bowld describes as "raw, organic, fast moving and honest metal." It is a diverse album that does not settle with a single sound, experimenting with the different facets of metal. Speaking about the albums diversity, Bowld states: "Metal is guilty of sounding very samey and it’s challenge to write a track that’s got 10 original tracks on it and I think we’ve done that." It is a fair comment by Bawld. The album darts between rock, melodic metal and thrash metal in an aural assault that has the expertise and confidence of a band that is both technically skilled and fiercely passionate about their music. Throughout the album, vocal duties are alternated between frontman Liam Cormier and Guitarist Matt Tuck, with the former taking the lead, enabling Tuck to take a break from the frontman duties he performs with Bullet For My Valentine. Having two capable vocalists has certainly given the band a a richer sound, but it hasn’t come without it’s drawbacks: "Ultimately you’re going to get Bullet fans saying that Matt should sing more and Cancer Bats fans wanting Liam to sing more." 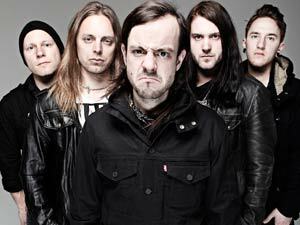 It is an inevitable result of the bands history, however Bowld is certainly justified in saying "I just wish some people could see it as a new band, and not compare us to Cancer Bats and Bullet." Bowld suggests that best way to listen to Axewound is to listen with no preconceptions. After all, fans expecting a Cancer bats or Bullet for my Valentine style record are bound to be disappointed. Thankfully Axewound have proved with Vultures that they more than live up to the hype, with a relentless, aggressive album that has proven the band are more than their constituent parts. With this album the band have propelled themselves to the head of an already burgeoning metal scene. Not bad for a side project eh?